Can technology ever replace an actual, real world experience? There is nothing better than real world, hands-on learning. Or is there? I would argue that use of technology can help to simulate real world experiences when resources such as time and money are not available. While it would be great for teachers and students to go on educational field trips all the time, to the different places around the world, this just isn't practical. Therefore, technology comes into play as the "next best thing" to first-hand experience. Simulating field trips with tools such as Google Cultural Institute and Google Earth can be very powerful tools, but it does not replace the actual real experience of visiting these places. Or does it? This quote reminds us that there is learning through the knowledge and experience of others, and there is learning through the act of experiencing. Which is more meaningful? Which is more powerful? 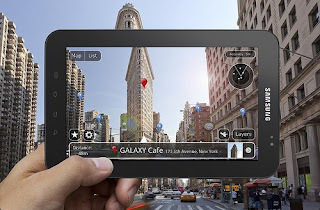 I will also add that technology can definitely "enhance" these real world experiences with the use of augmented reality. For example. The invention of the Smartphone was a game changer. Now when we are at (some of) these real life places, we can take pictures, video, look up information in real time, get our questions answered, and use apps that might help us to learn the information quicker and more efficiently. While sitting in a classroom taking a virtual field trip to the Chesapeake Bay to learn about food chains in the wetlands is a great learning activity, it does not come close to the actual experience of seeing these animals in real life, in their actual habitat. On the other hand, using tools such as a Smartphone can truly enhance the learning experience while you are there. Now with the invention of Google Glass ... possibilities seem to be endless for technology enhanced learning. Secondly, I would argue that some virtual experiences of places might be even better than visiting in person. For example, Google Art Project is truly amazing. With this virtual simulation, you can look at just about any famous piece of art, take a tour of Art Museums with Google Street View, and best of all, you can get much closer to the pieces of art than you could if you were actually standing in the museum. Furthermore, you can zoom into the high-resolution pictures of the artwork to gain an even deeper experience and possibly even create more opportunities for inquiry. Let me show you can example. Here is the Art Institute of Chicago with the view of A Sunday Afternoon on the Island of La Grande. With this technology, you can simulate a real life experience of walking through the Art Institute of Chicago and freely examine different pieces of art, at your leisure, any time, any place. Now, here is just the painting where you can zoom in to explore the painting in greater detail than in real life. Be sure to zoom in as far as you can go, to almost feel the texture of the painting. There is no way you could get that close if you were actually visiting the museum in real life. So the real question remains; "Can technology ever replace an actual, real world experience?" I would argue that when real-life experience is impossible, technology can make learning possible. Technology might not be a substitute for real-world, experiential learning, but it makes possible what was once impossible!